Of course, we knew we could be wrong...but it was fun guessing! Every thing is coming to a explosive climax Barnabas T. Bullion is trapped in the angry mine with Onawa. Will both of them leave the mountain alive? What about the trapped miners? 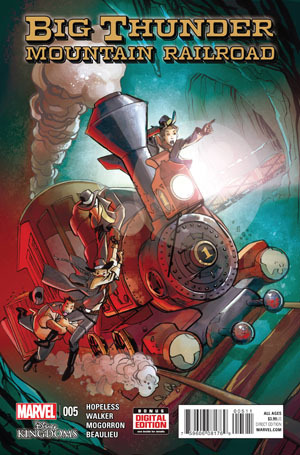 Can Bullion lead this group on a train ride to safety, or will it be the wildest ride in the wilderness? Meanwhile Willikers has captured the bandit of Abigail Bullion and Chandler. Can the young lovers escape their captor and help find a way to save Bullion and the miners? But most of all, can the mountain's rage be stopped? All these questions are answered as Big Thunder Mountain Railroad races to conclusion! Dennis Hopeless proves in the final installment of Big Thunder Mountain Railroad that his entire tale is a family based morale story, where bad guys get this punishments and misguided fools learn their lessons. Kids will likely see the message in the stories conclusion. And adult Disney fans will be pleased with the artist's addition of Disney Parks Easter eggs in the backgrounds and action. For me the biggest and most exciting gem of was the full identity of Chandler revealed. This moment made me hopeful that we could discover more adventures within Disney Kingdoms that are linked to this story. And perhaps it would be possible to link this story to the tales of Dreamfinder and Figment in a Disney Kingdom's universe. And overall while Big Thunder Mountain was not my favorite of the Disney Kingdom's series, I still found in the end thrills for the Disney fan.